I had ridden Amtrak’s California Zephyr, Empire Builder, Cardinal and Adirondack routes before, and thoroughly enjoyed taking in their scenic wonders from either the Superliner Sightseer Lounge car or my coach seat. But being able to experience these four routes in a dome car took the already unmatched experience of the landscape that train travel gives you to a whole new level. The Sightseer Lounge comes close, allowing one a fairly complete view to both sides as well as upward. But adding the forward and rear view from a true dome car, as well as the sense of floating above the rest of the train, adds that much more to the grandeur one is able to take in. The dome car is an American invention. Only the United States and Canada have anything quite like it in the world. Other continents’ passenger trains have various types of observation cars, some with wraparound windows and several allowing rearward viewing. But it was the awe-inspiring views of the American West from rails that wind through canyons surrounded by multi-colored peaks and cliffs — specifically on the Denver & Rio Grande Western through Colorado, today’s California Zephyr route — that inspired the first successful dome car design, by Cyrus Osborne of General Motors’ Electro-Motive Division. This innovation remains a singularly unparalleled way to experience such routes — the Sightseer Lounge doesn’t quite do it justice. 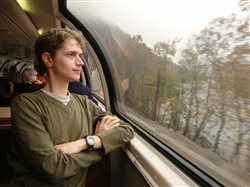 Passengers enjoying Amtrak's lone dome car, the Ocean View, winding through the New River Gorge behind train 50 on Nov. 3, 2011. Photo by Malcolm Kenton. I have gotten to experience the Zephyr, Builder, Coast Starlight, Southwest Chief and Sunset Limited routes in dome cars because I have been fortunate enough to travel on private railcars behind the Amtrak trains. But my dome experience of the Cardinal and Adirondack routes come courtesy of the only true dome car that Amtrak maintains on its roster — the full-length, No. 10031 Ocean View, originally a Great Northern Railway Great Dome. Sadly, Amtrak only offers a handful of opportunities each year for the public to enjoy one of train travel’s greatest pleasures. The company could have maintained and restored many more dome cars that it decided to sell or scrap in the 1980s and 1990s, but management seemed to lack an understanding of these special vehicles’ value. The Ocean View will return to the Adirondack between Albany and Montreal this year. But no plans have been made to return it to the Cardinal, a route perhaps more deserving of a dome car than any other east of the Mississippi. The Ocean View only ran on two Cardinal round-trips between Chicago and Washington in the falls of 2010 and 2011, but hasn’t been back since. There is a group of passenger advocates along the Cardinal route urging Amtrak to bring the dome back, and all are encouraged to join their cause. If I were in Amtrak operations or marketing, and I had only one dome car to work with, I would make sure that it was used to the fullest extent. When not in use for business and special trips, I would circulate it throughout the system, using it mainly on routes like the Cardinal. And when, not if, Amtrak makes additional equipment orders to augment and eventually replace the Amfleet and Superliner fleets, management should seriously consider ordering more dome cars, and then follow the playbook of Amtrak’s predecessors in presenting the domes as a key selling point for the joy and educational value of the company’s incomparable product. Dome cars also provide an ideal tool with which to expand the types of markets to which long-distance train travel may appeal. School groups from elementary schools to universities should use train trips as mobile classrooms. Companies should have leadership and team-building retreats for employees on board trains. Affinity groups interested in a variety of subjects — from food to history to music to geology to sports to social innovation — should have opportunities to explore their areas of interest on a trans-regional scale through train travel. A wise passenger railroad would exploit the fact that trains are so much more than a means of getting from point A to point B, and Amtrak has only scratched the surface in this regard. Alfred Runte’s book Allies of the Earth was a touchstone for expanding the way I think about passenger trains, their role in tying America together, and the great potential inherent in reviving them as a major mode of transportation. It contains a reprint of a 1966 advertisement for the Santa Fe, depicting a full-length dome car atop these words: “It can’t write. It can’t read. It doesn’t have a degree. It never went to school. But after books, it’s one of the best teachers of American history.” Based on my experiences, these words ring true: Americans’ appreciation of the breadth of our country and the rich tapestries of its landscapes — natural and human-made — would be greatly enhanced if more had the opportunity to witness them by train, and particularly from a dome car.